Stress increases the body's need for nutrients, especially those necessary to sustain the healthy adrenal hormone production that is essential to the ability to cope with stress and maintain homeostasis. * Super Adrenal Stress Formula is a unique nutritional supplement formulated by Dr. Wilson specifically to aid in stress recovery and support physiological balance during times of stress and/or adrenal fatigue by providing nutrients essential for optimal adrenal function. Ingredients - A specific blend of vitamin A, vitamin C, vitamin E, vitamin B1, vitamin B2, vitamin B3, vitamin B5, vitamin B6, biotin, folic acid, magnesium, manganese, zinc, chromium, copper, selenium, bioflavinoids, L-5 hydroxytryptophan, choline, kelp, and potassium para-aminobenzoic acid. Other Ingredients: Dicalcium Phosphate, Cellulose, Inulin, Carbomer, Steric Acid, Magnesium Stearate, Pharmaceutical Glaze. 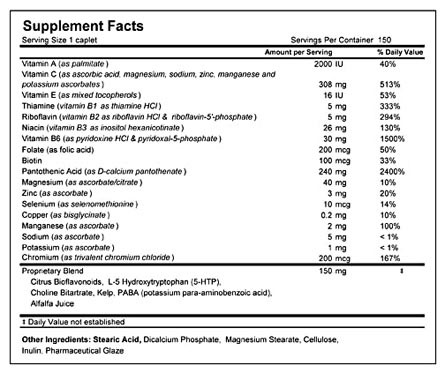 Directions for use - 1-5 caplets per day or as directed by your health practitioner. Quality and purity - Super Adrenal Stress Formula is VEGAN and DAIRY-FREE. It contains NO animal products, milk, egg, salt, sugar, wheat, gluten, yeast, corn, soy, or artificial coloring, flavoring or preservatives. I was diagnosed with Adrenal Fatigue and started the Adrenal Rebuilder, building up from 2 to 6 caps. I am happy and much more relaxed today and don't want to miss them anytime soon!